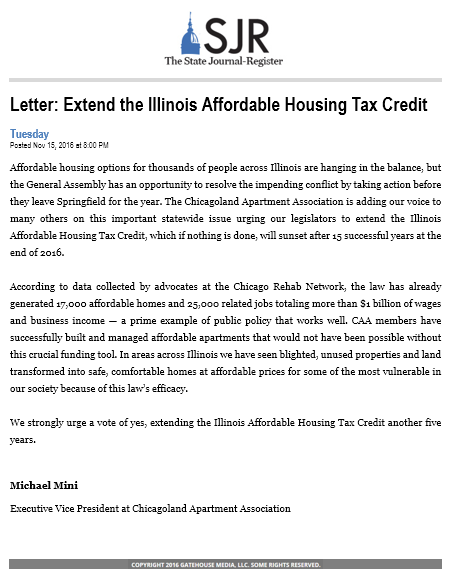 With the Illinois Affordable Housing Tax Credit (or Donations Tax Credit) scheduled to expire at the end of the year, CAA urged the General Assembly to approve legislation during this week’s Veto Session to extend the life of this critical program. CAA expressed support for HFA #2 to SB 2921 during a hearing before the House Revenue Committee earlier this week. The amendment was passed out of committee and approved 79-29 by the full House. It is now scheduled for consideration by the Senate during the second week of Veto Session later this month. Click here to read a copy of CAA’s letter-to-the-editor published in the Springfield Journal-Register on November 15th.